In my last post, I commented on one of the issues which arises when deciding which photograph to publish for the week. In that instance, I had three candidates and for the sake of variety opted for the one which it would not be possible to repeat. This time, the problem is different in that I have a number of shots which could make the grade. It was a good week, both photographically speaking and otherwise. One benefit of creating a blog article each week is that it allows the possibility of featuring alternative shots. I took this while on a photo walk with one of my camera clubs in and around the City of London. Usually I treat these affairs purely as social events and any reasonable images are a bonus. Sometimes they do prove to be very productive and this was one such occasion. 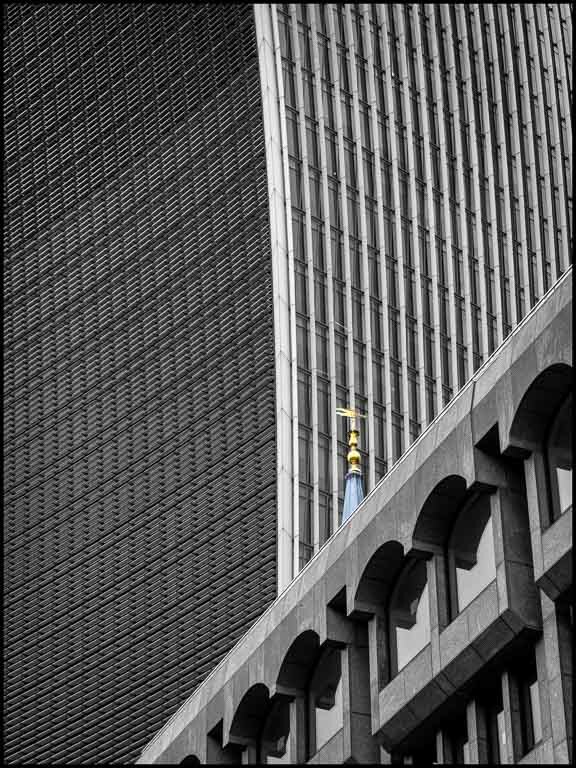 There are many churches within the City of London and many are still in use. These days, they are dwarfed by the skyscrapers which have appeared during the past few years. The walk ended just off Brick Lane where there is a wall frequented by graffiti artists. They proved to be very friendly and did not mind having their picture taken. I enjoyed chatting with them as they worked. If I can find the time, the shots I took that afternoon would make a blog post on their own. For a while, this was going to be my shot of the week mainly because I enjoyed the experience of photographing them. In the end, though, “Family Group” proved just too strong an image to ignore. 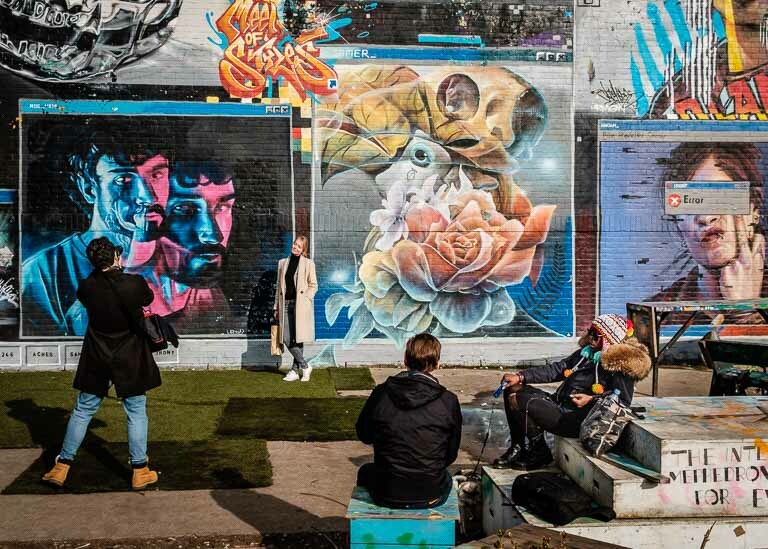 The Nomadic gardens is a community area next to the graffiti wall. There is some graffiti there as well. 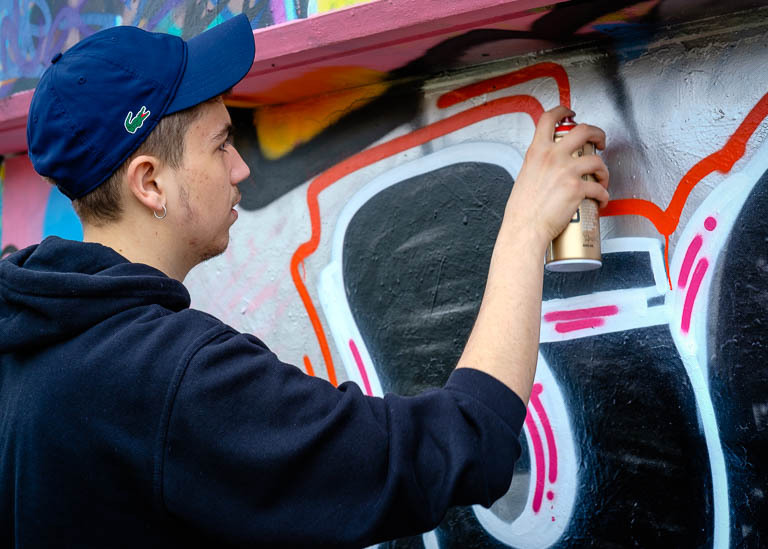 Unlike the wall, where the artists habitually paint over each other’s work, the art on display is more permanent. I suspect, though, that it still changes over time. The main wall at one end of the gardens proved very popular with lots of people taking photographs. 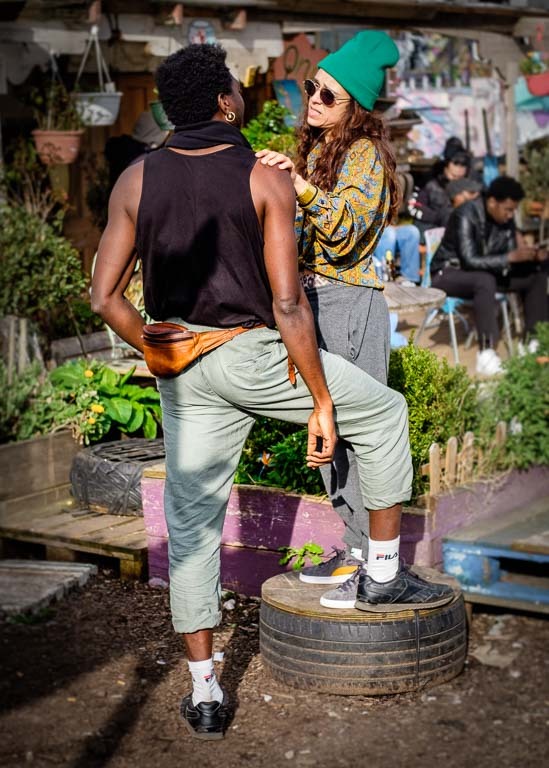 A candid shot in the Nomadic gardens. I could not resist this shot while walking around Brick Lane. The dogs seemed quite content with their lot. The Royal Horticultural Society’s garden at Wisley looked amazing. Probably the best I have ever seen it. The reason was that many of the trees were in blossom. Apparently, a mild winter which did not have too many cold snaps allowed the blossom to flourish. Not just at Wisley either, as the trees in my locality have also been putting on a good show this spring. I also went to see the Don McCullin exhibition which is currently on at Tate Britain. While he does shoot in colour, all the main images were monochrome. He is an amazing photographer although his many depictions of humanity’s worst aspects are difficult to look at. It does not pay to exercise one’s imagination too much about what was happening. Nor do I really comprehend how he was so frequently drawn to war situations. Towards the end of the show there are some of his landscapes which are invariably bleak, although one does show some crepuscular rays. Which marks it out as an exception in his body of work. A ray of sunshine in a Don McCullin photograph. When going through the week’s images looking for “the one”, I had a number of options. 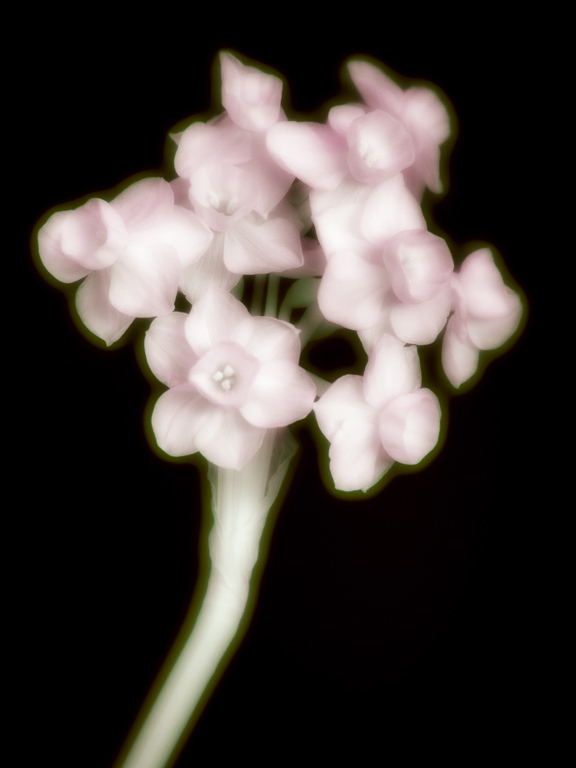 I could have shown the latest in the series of flower images I have been making in the past few weeks. They are good, to my eye at least, but would repeat what I have done previously during the project. I also have some family shots which are personal and not for sharing. Eventually, the choice came down to some shots of herons in flight taken at a local park and the one here, “Red Queen”. The decision made simply because this is a set-up which will not be repeated. The park I can visit at any time and maybe get some better light than I experienced previously. When doing a project such as this, variety as much as quality can be the ultimate arbiter. This shot was taken on the Fuji stand at The Photography Show held at the NEC in Birmingham. For the past few years, Fuji has always had something to photograph. This time there was an “Alice In Wonderland” theme. Initially we only had the Mad Hatter, who was suitably eccentric both in dress and manner. Later on, the Red Queen* joined him. Not exactly the harridan Lewis Carroll depicted in his book. While the setting was picturesque and handed to onlookers on a plate, photography was not necessarily straightforward. Firstly, there was the light which consisted of the standard illumination in the hall. Flat and even, great for looking at everything on display at the show, just not much of it. I wanted a high shutter speed to counteract subject movement and a reasonably wide aperture. That meant my shots were all at ISO 3200 and f/2.8. Then there was lens choice. I had only taken a couple to the show, both from Fuji. I had made my selection to keep the weight down on a day when I did not expect many shots. There was the 18-55 for versatility plus the 56 f/1.2. I chose the latter for its speed and ability to isolate subjects from the background. That was the one which ended up on the camera. The problem was that it was just a fraction too long and it was not always easy to get everything into the frame. Then there were the models who were left to do their own thing. With so many people wanting shots, direction was not a practical option. As so often happens with photography, chance played its part in the final result. 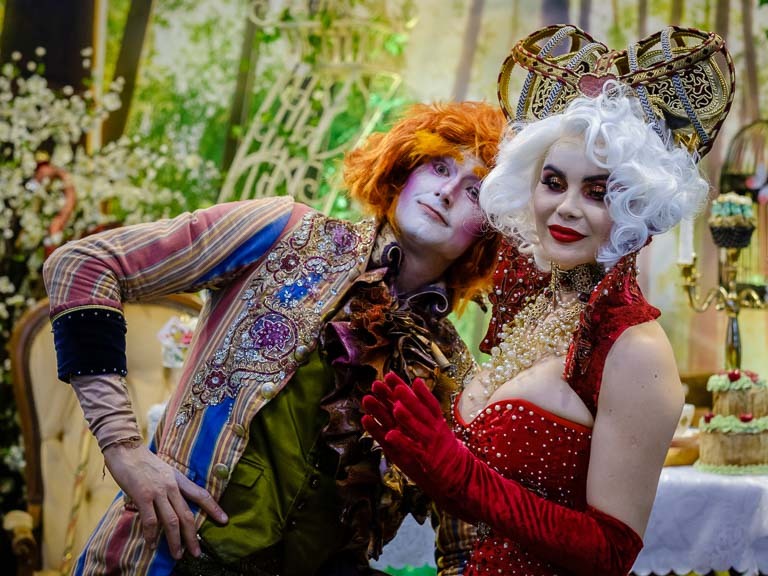 A shot of the Hatter and Queen together. Lewis Carroll wrote two books featuring Alice as the heroine. The first was “Alice In Wonderland” with “Alice Through the Looking Glass” as its sequel. Each book has a character who is a queen, but the two are very different in personality. Alice In Wonderland has the Queen of Hearts to whom the desctiption of termagant could apply. 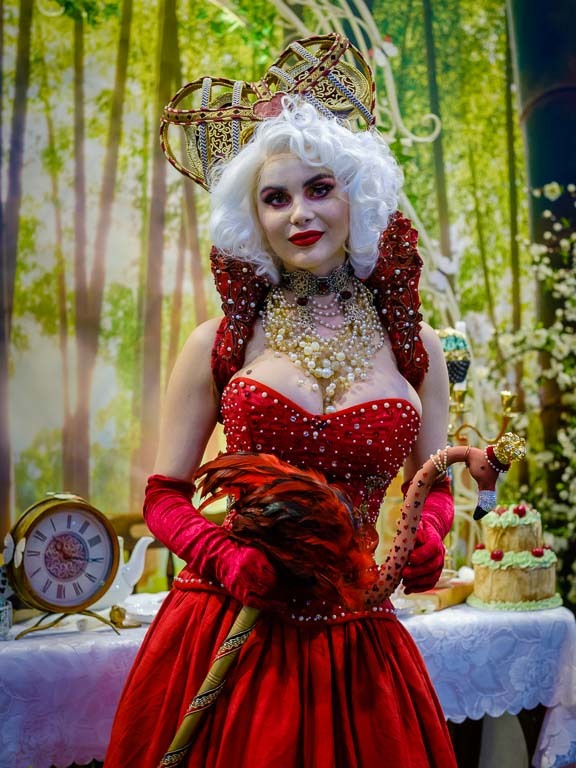 The Red Queen appears in Alice Through the Looking Glass. Although formal, she does not share the other’s anger and is not unkindly. In common culture, the two queens have become conflated into one. The setting for my shot is almost certainly the Hatter’s** Tea Party from Alice In Wonderland. Yet the queen is dressed in red and without any emblems suggesting she could be the Queen of Hearts. Moreover, she is holding a flamingo. That, too, is a reference to the first book when the Queen and Alice play a game of croquet using flamingos instead of mallets. Given I had to opt for one or the other when titling the image, Red Queen seemed more apt due to the model’s costume. Wikipedia has more about the two queens and how they are often mistaken for each other at this link. ** Yes, a footnote to a footnote. Lewis Carroll simply called his character the Hatter. The “Mad” epithet did not feature although it was a term routinely applied to those who made hats. The primary cause was almost certainly neurological damage due to the use of mercury in the felting process. Again, Wikipedia has additional information. 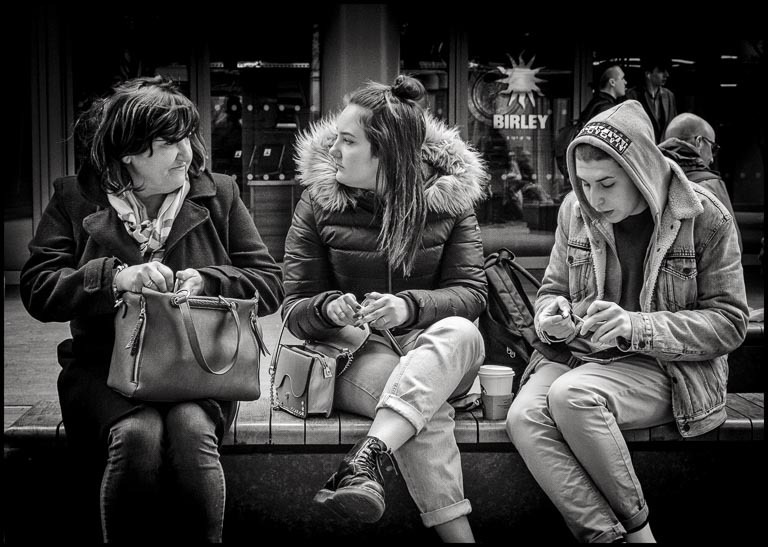 This shot, Pairings, was taken at the conclusion of a street photography walk. It was a circular tour, going from King’s Cross in London to Camden Market and back. This is a well known location which I have never previously managed to find. 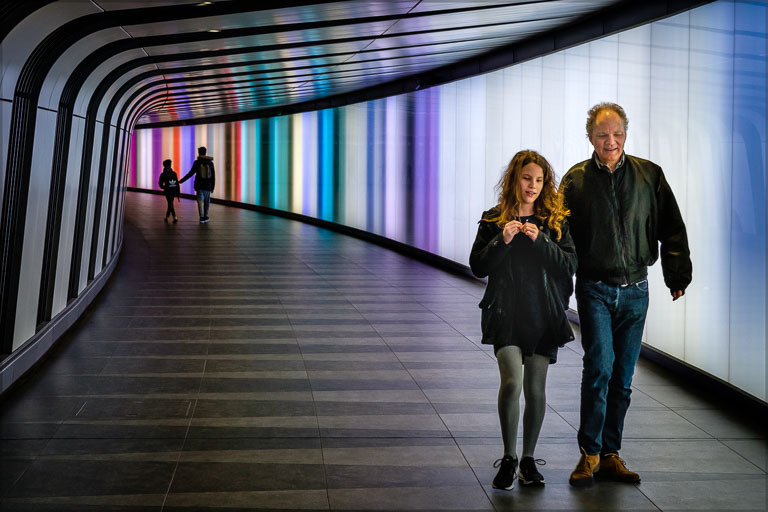 It is a subway which I had heard described as being a link between King’s Cross and Paddington railway stations. 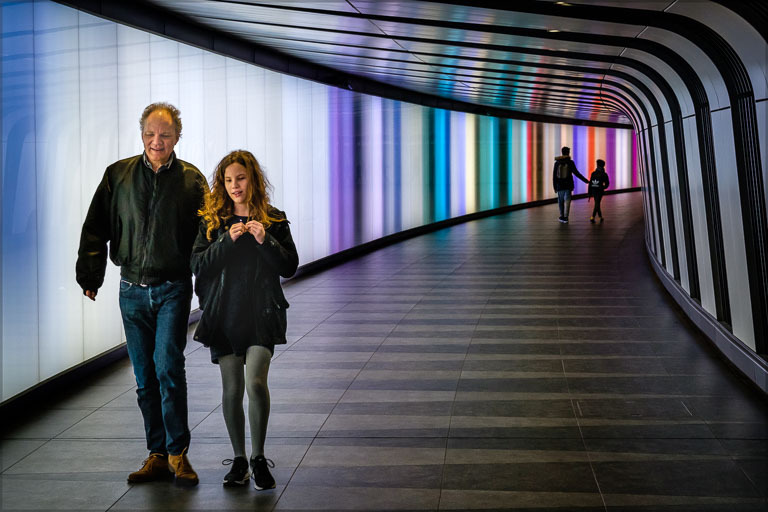 In reality, it is one of the entrances to King’s Cross. I had been looking, just not in the right place. The usual shot here is to have an otherwise empty corridor with a small figure at the far end to provide a focal point. On a busy Saturday afternoon, that was never going to happen. This was about as quiet as it got and as close to the “ideal” composition that I saw while I was there. I am a few weeks behind with my shot of the week posts, but that is no bad thing. When I first saw this image, I thought that the empty area on the right would be better if filled with the main subjects. The smaller, but equally important figures in the background, seemed to leave an empty space. While creating this post, I realised that the image as shot image is in reality the stronger. The “empty” space acts a lead in to the subsidiary figures while the main subjects drag the eye back. Being on the right is the weaker position. Purists might argue that flipping images goes against the spirit of photography. Unlike other art forms, ours is a realistic medium in as much as it captures light which was there at the time. That does not mean that we should always remain faithful to the original capture. Besides, there is no such thing as straight image. Whether film or digital, the image requires some processing afterwards capture and decisions made about presentation. Even supposedly unmanipulated images on slide or instant film are not immune. The way they render will have been determined in advance and with slide film the photographer will choose one which suits the subject. Very, very occasionally, I do reverse images. In most instances, though, I invariably prefer the original composition. It was how I saw the scene and what made me take the shot. The reason that I do not do it more often has nothing to do with the sanctity of the photograph. That is a poor motivation. It is only the final result which matters. If one word sums up my photography for this week, it is “barriers”. With a lot going on, there was just one opportunity for a photographic outing. Naturally, I went where there might be some good prospects. First stop was the BBC’s new headquarters at the end of London’s Regent Street. Frustratingly, part of the iconic forecourt was sectioned off for filming. Never mind, the Millennium Bridge across the Thames was a short bus ride away. That is always good for a few shots. Except this time it wasn’t. Half of it was fenced off for the installation of new lighting. Well, the Turbine Hall in the Tate Modern Library has proved fruitful in the past. You guessed it. Closed off to the public. Some days, photography is like that. Come to think of it, life is like that and does not always go to plan. 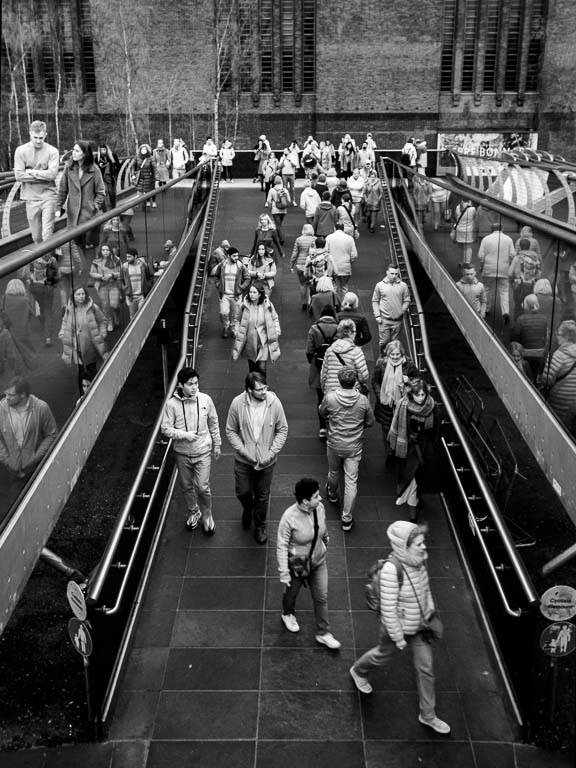 Eventually I found my shot for the week at the southern end of the Millennium Bridge. Thankfully, that section was free of barriers. You might think it strange that many people are wearing light coloured clothing on a cold and dull day. Except all is not what it seems. This is a monochrome conversion of a shot from an infrared camera. 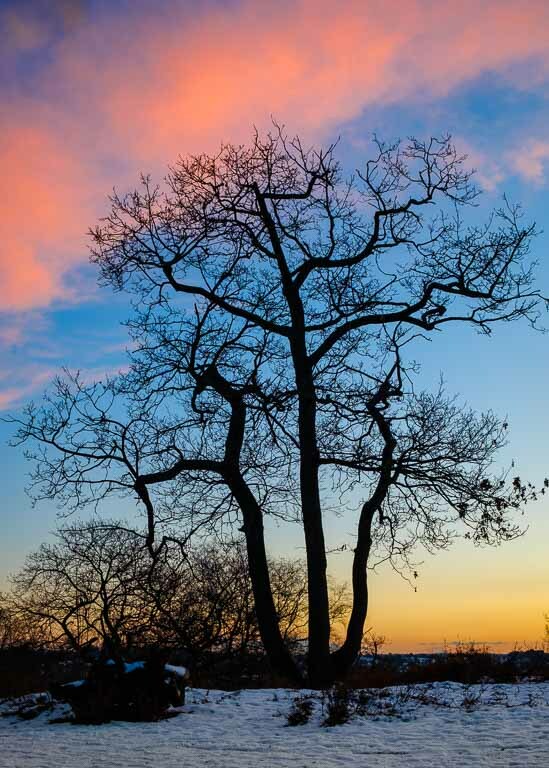 Infrared images are typically noted for effects such as foliage appearing lightened and skies turning dark. Yet long ago I discovered through experimentation that in scenes where those elements are not present, an infrared camera is usable for monochrome. Admittedly, unlike a true monochrome camera which records only tones and no colour, conversion to black and white is necessary. With that proviso, it creates some interesting images. The dyes in artificial fabric do reflect a lot of infrared light, which accounts for the appearance of people’s clothing in this shot. A further example of a monochrome image from my infrared camera is below. 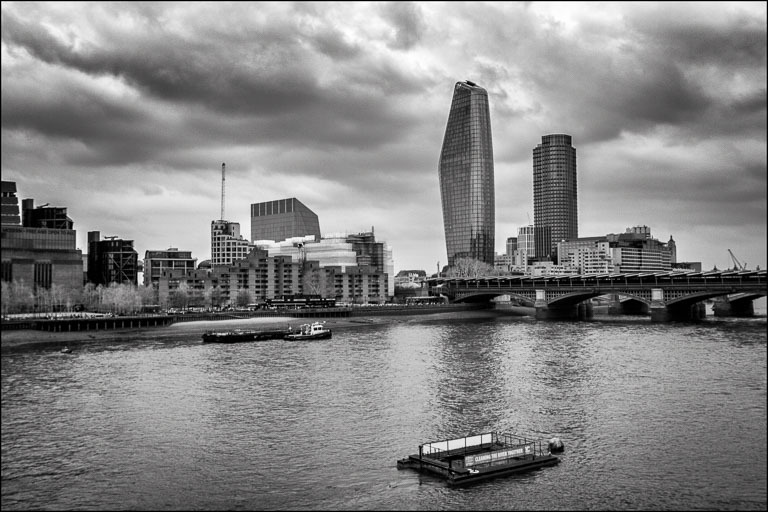 I took it as I crossed the Millennium Bridge, looking across from the opposite side with all the fencing. Had the sky been clear instead of cloudy, it would have been rendered black. Which, all things considered, is not a bad idea for a future shot. While I wrote about the barriers which appeared in the photos I would like to take, I did come across a hindrance of another kind. Namely my camera. I was using my Canon EOS 7D which, according to Lightroom, is the one I have used most. It accounts for around a third of the images on my hard drive. For a long time I have appreciated its ergonomics but not its bulk and weight. In an effort to reduce the load, for a while I experimented with micro four thirds cameras but never really committed to the system. Then I discovered Fuji’s cameras. A X-E2 with the excellent 18-55 lens became my mainstay for a few years, being compact, light and versatile. It has been responsible for a number of my most recent successful images. Recently I added an X-H1 which has been a revelation. While it is a more substantial camera, it handles in a similar manner to my 7D. Put simply, it feels right and is at home in my ha In a way, I might add, that the X-E2 does not despite its many other virtues. Using the Canon 7D again, it felt clumsy by comparison. That partly explains why I was shooting in locations which are not normally associated with infrared. Aside from my usual experimenation and wanting to see how things look in infrared, that is. The camera is a modified 450D which is smaller and it felt more convenient. One of my requirements for a camera is that it should not get in the way of my photography. That is a criterion which the 7D no longer consistently fulfils, which made me reluctant to take it out of my bag. There are many positives to undertaking a challenge which requires the regular production of images. Not least is the incentive to use the camera. Life has plenty of other distractions and it is all too easy not to take a photograph for a while. Another benefit such a project is the opportunity to try different styles of photography. 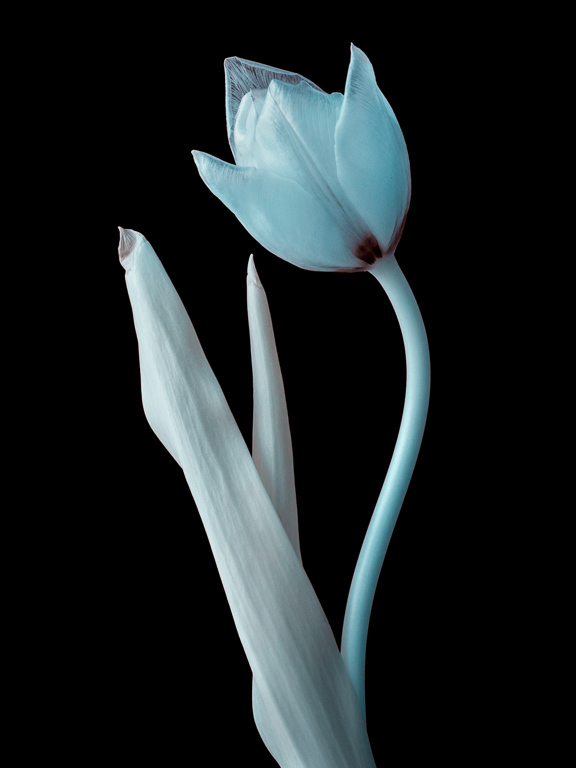 A couple of weeks ago I was doing just that when shooting a tulip past its sell-by date in infrared against a black background. I like to photograph a variety of subjects, but that particular shot got me thinking about other possibilities. There was definitely scope for further experimentation in a personal project which has no rules about repetition. The shooting set-up this time was similar but I chose a tulip which was definitely in its prime. At least, I hope so as I had bought it earlier that day. I again shot with my infrared camera but used a different lens. One which is marketed on the basis that it is not very good. Or rather, that its optical defects introduce an ethereal quality to images taken with it. In other words, character is a more important attribute than absolute sharpness in its rendering. The lens? It is Lomography’s Daguerreotype Achromat 64 f/2.9 Art Lens to give its full title and a reinvention of the world’s first photographic optic lens. The original was created in the 19th century by Charles Chevalier for the Daguerreotype camera. Optically, both versions are alike in that the design consists of two lens elements in a single group. The modern update has features which were not present in the original. It is conceivable, for example, that the Chevalier lens did not have an internal focussing mechanism. What I can be certain about is that dating to 1839, it did not come with a choice of mounts such as the Canon EF fitting on my copy. It also seems that the first lens came with a fixed f/4 aperture. The Lomography reinvention uses Waterhouse stops to change the aperture. These are plates with circular holes which are inserted into the lens barrel. Granted that it is not as convenient as an aperture ring but this is a manual focus objective and operation is not going to be quick. Besides, although capable of serious work, in some ways the Daguerreotype lens is a novelty. The Waterhouse stops add to its appeal. It is possible that my description of the Chevalier lens is not entirely accurate. I have done some research on the Internet but details are frustratingly vague. The most informative article which I have found is from Lomography, although it is not as comprehensive as I would like. Wide open, the Daguerreotype lens produces a very ethereal looking image. Stopped down, it becomes surprisingly sharp despite the simplistic optical design. Wide open at f/2.9, it can be very soft. At f/4 some of that softness is reamins but already it is appreciably sharpening up. This shot was taken at f/5.6 which is the limit for retaining any of the len’s characteristics. Focussing proved to be a challenge. My infrared camera is a modified Canon EOS 450D and usually I rely on autofocus. Focusing using the viewfinder on a DSLR is difficult as it lacks the necessary aids which were abundant in the days of manual focus. Fortunately, the camera has live view but in infrared everything looked grey. Added to that, a soft focus lens does not provide much detail to determine easily the exact point of focus. I found it best to use one of the smaller stops to get the clarity I required and magnify the image. f/5.6 worked well and once I was confident of the focus I could switch to a larger aperture if I wanted that option. Colour is our eye’s response to different wavelengths of light in the visible spectrum and it follows that colour cannot exist in infrared. A digital camera is still recording in colour and some hues will be apparent in the image. This provides an opportunity to introduce false colour effects during post processing. The colours of my tulip shot are not dissimilar to how it looked although that is a coincidence. Other flowers with different colouration which I photographed at the same time turned out similarly with the same processing applied. The final change was to flip the image for a stronger composition. It looks as though the flower is saluting, hence the title. I know, I have anthropomorphised a tulip of all things. To give a better idea of how the Daguerreotype lens performs at its maximum aperture, I took this shot with lens wide open. Again, I used my infrared camera. In reality, the flowers were white and yellow, not pink as seen here. A shorter than usual blog post than usual for this week’s image for the week. There was a lot going on which did not leave much time for photography. 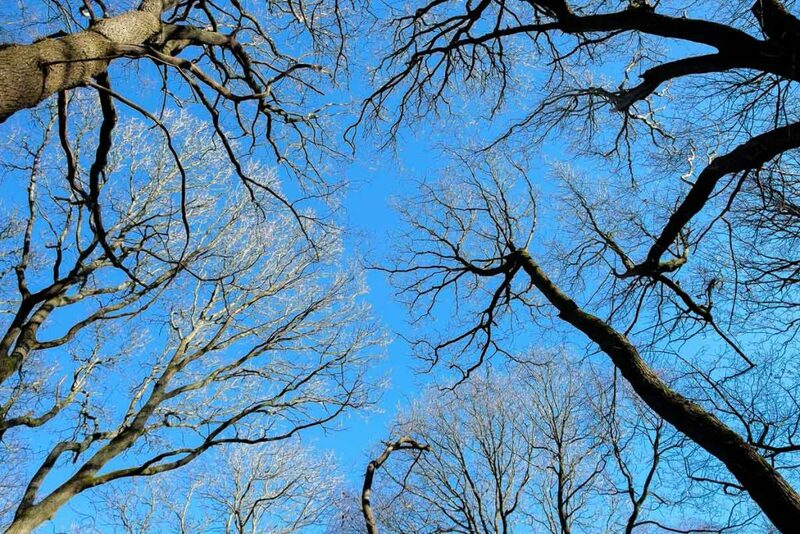 I took this photo in my local woods and enjoyed seeing the sun catching the bare branches at the top of the trees. The bright day is a harbinger of the forthcoming spring and warmer days. During what was a quiet period photography wise, I was looking for a subject in the house for the week’s photo. I had a few ideas before finding this tulip which had, admittedly, seen better days. As well as its faded glory, the stem had become twisted with age into an interesting shape. While I could have done a straight shot, I wanted something a bit different. That was when the idea of shooting it in infrared came to me. I have done something similar before but realised I had never tried using a black background. Intrigued, I set up the shot to see how it would turn out. Foliage naturally reflects a lot of infrared light which means that it turns pale when photographed with an infrared camera. Combined with the black backdrop, it produced the high contrast look you see. 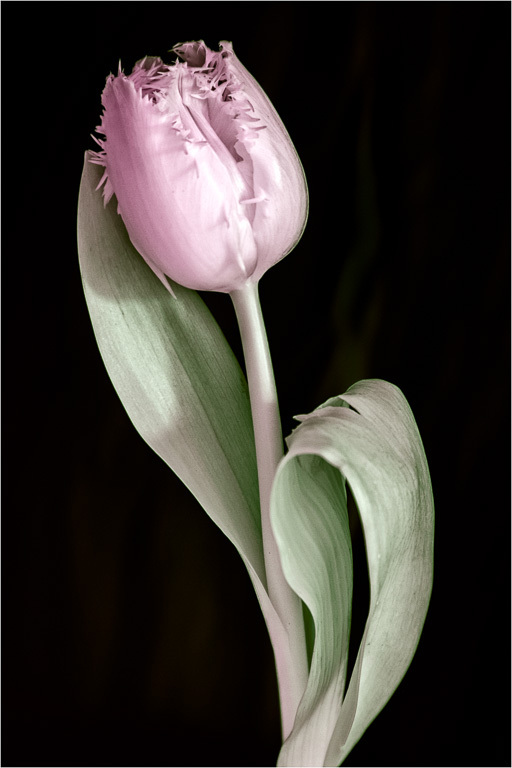 The tulip being less than pristine does not matter so much as the infrared rendering mainly masks the imperfections. Not that it would necessarily be a problem as we photographers sometimes like a bit of decay. It has its own aesthetic appeal. I processed the Raw file in Lightroom. In theory, colour does not exist in infrared as it sits beyond the visible portion of the spectrum. In practice, some colour will be apparent. The camera’s digital sensor is still registering red, green and blue tones, although most of the information is in the red channel. With the default rendering, the black velvet cloth I used initially appeared to be dark blue. A quick adjustment of the Shadow slider returned it to black without affecting the other tones. Conversion to monochrome was in Silver Efex Pro 2. The presence of colour in the capture allows the option to have false colour effects. I experimented in Photoshop to produce this version with some delicate blue hues. The processing was straightforward. First, I swapped the red and blue channels in the Channel Mixer. In the red channel, I set red to 0 (zero) and blue to +100. In the blue channel, blue became 0 and red 100. I then boosted the resulting blue tones using Vibrance. Someone remarked that so far this year I have been doing a lot of travelling to obtain my shot of the week. That has been purely coincidental since I was visiting those areas for reasons other than photography. On this occasion, though, I have stayed closer to home, the woods behind my house to be precise. Although less than two miles from the centre of town, it is an ancient woodland and a Site of Special Scientific Interest. There is, apparently, evidence of occupation going back to the late Mesolithic era, between 5000 – 3000 BC. It is a remarkable landscape to have in an urban area. On the day, I was fortunate to get some attractive light from the sun as it set. A few years ago, I did a photo-a-day project and hoped that there might be some snow to provide a few picturesque images. It was a case of being careful of what you wish for. The white stuff did indeed come and there were two prolonged spells. 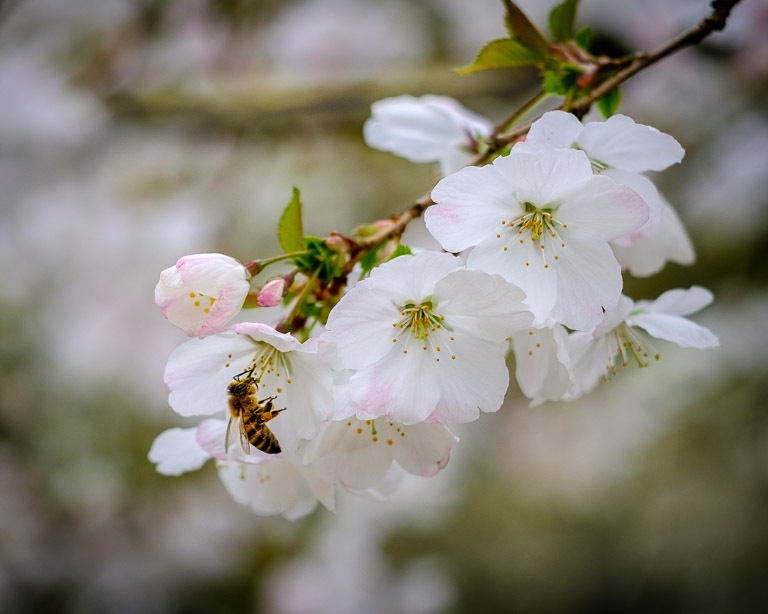 In terms of duration, it was the coldest winter of recent years and temperatures remained unseasonably low during the spring and into early summer. I was still wearing gloves in June. This time around, mindful of what had occurred previously, I was indifferent as to whether there would be any snow. Not that I am superstitious nor that it made any difference; it happened anyway. Albeit not to the extent experienced a few years ago, not so far at least. There is still time with a fair bit of winter to go and March can be a cold month at its beginning. Last year, it was the end of February when the “Beast from the East” swept in. Given there was snow, I wanted to take advantage although we seemed to have escaped the worst of it in this part of the country. Consequently, it did not settle too thickly. That was great for being able to get around, less good for photography. Nevertheless, I took the opportunity to explore the woods and went there a couple of times. The best conditions occurred on my first visit. 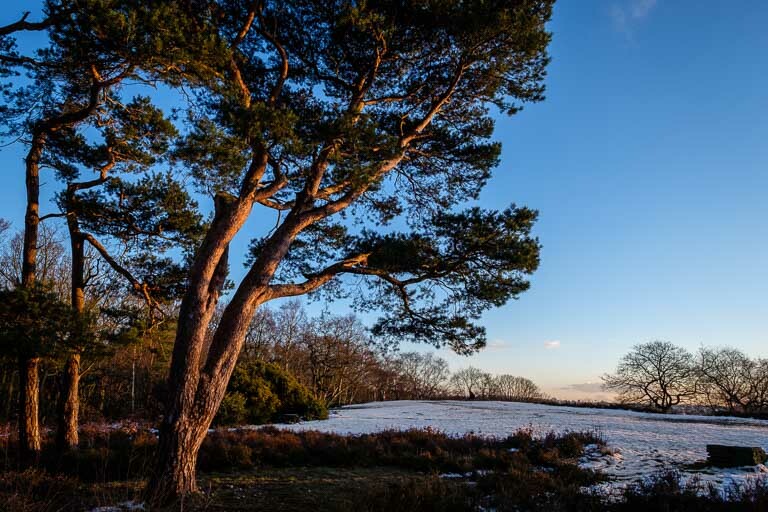 The woods are on a hill and there is a small area of open heathland at the top which catches the afternoon sun. I had an anxious wait as the sky was mostly clear, except for a large cloud covering the sun. Eventually it moved away and there was some glorious light until sunset, when the sky lit up with colour. 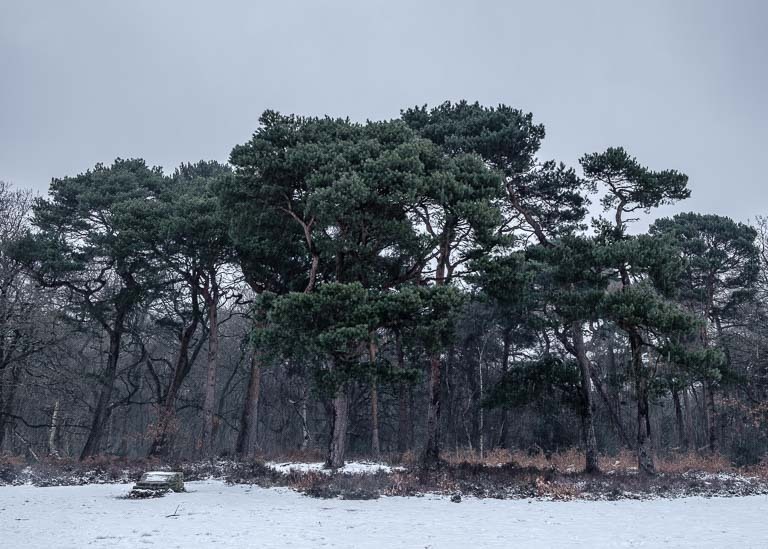 A prominent feature at the location is a small stand of Scots Pines on which I mainly concentrated. 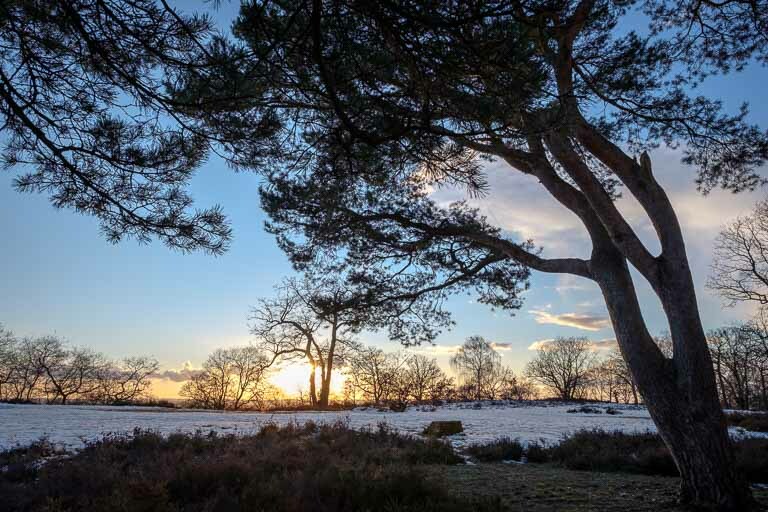 My chosen image for the week was taken looking out from among the trees towards the setting sun. It has a monochromatic feel and I did try converting it to black and white. That only had the effect of making it less obvious that the bright patch behind the distant tree is the sun. For me, it is a shot which needs some colour, even if there is a limited palette. 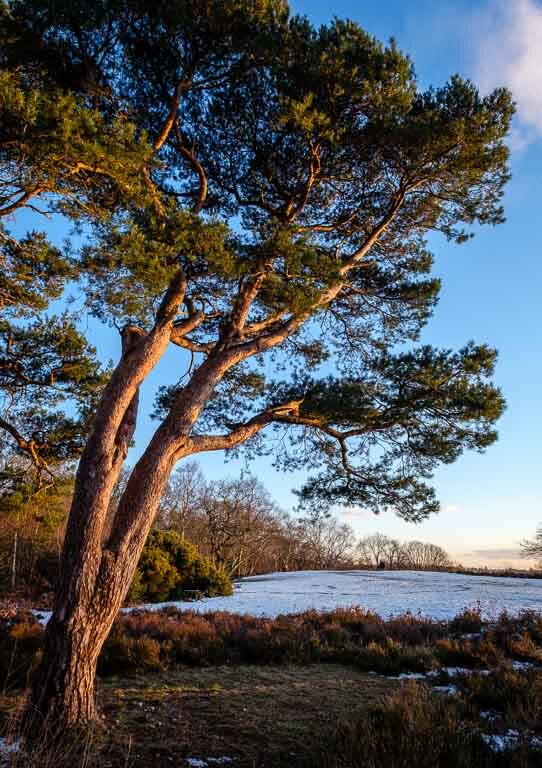 The Scots Pines can, in the right conditions, look good when viewed from the opposite side of the heath. Snow provides one such opportunity, especially if has settled on the trees. Since more snow had fallen overnight and it was only a few minutes’ walk, I went back a couple of days later to see what was happening. The omens were not good as trudged up the hill. The sky was overcast and a thaw was already under way. Any snow which might have been on the trees was long gone and on a grey day there was no detail in the clouds to provide an alternative area of interest. Photography can be like that. Sometimes shots work out, other times they are less successful. On both occasions, I had the luxury of being nearby and observing the conditions before venturing out. This second time, it was more in hope than expectation. Added to which, there was some precipitation in the form of sleet. Despite using a lens hood and keeping the camera pointed down while not shooting, it was a battle to keep the front element clear of water droplets. There will be other days when conditions are more conducive to imagery. I like to ensure that I take a photo early in the week so that I know I have something. Flowers are a good standby and this week was no exception. It is another taken with a manual focus macro lens, this time a Leica Elmarit-R 60 macro f/2.8. The design dates back over 50 years and my copy is around 40 years old; it is tack sharp. Leica never recomputed the lens throughout the life of their R series cameras, which ceased production in 2009. There was no need. Unlike the vintage Vivitar 55 macro lens which I have used previously, the Leica performs well at all focussing distances. Some people opt to use it as their standard lens in preference to the Summicron-R 50 f/2. A minor downside is that the manual focussing ring has a long throw, being optimised for the fine adjustments required for macro work. All it really means is a bit more turning is necessary, which can make focus fractionally slower to achieve. Natively, the Leica macro lens focusses to a 1:2 reproduction ratio. 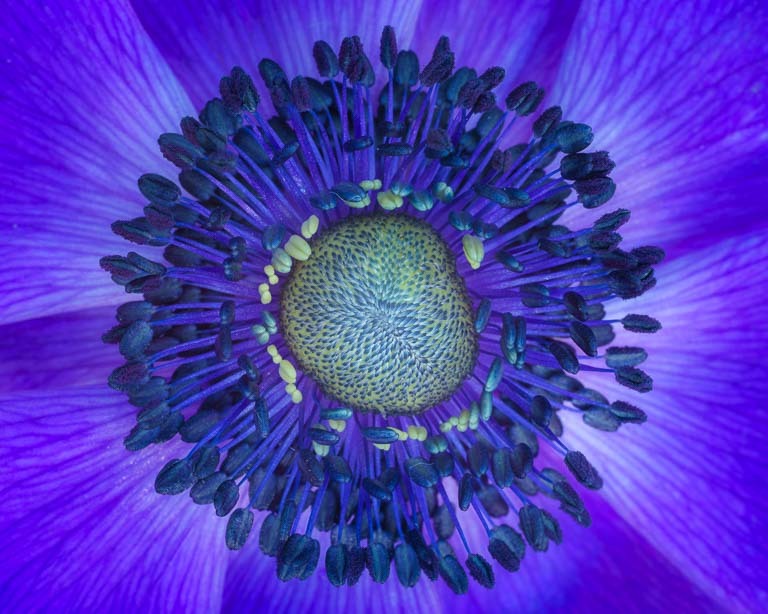 That did not quite fill the frame for this shot of an anemone, but there is an optional dedicated extender which takes the lens to 1:1. I attached the lens to my Sony A7 II and the aperture was f/16 to maximise depth of field. A spectacular claim indeed. One for which I make no apology, even though our planet has no shortage of scenic landscapes at which to marvel. But this location is both distinct and unique and I am far from the first to have thought this to be an impressive view. On the hill behind where I stood, a ridgeway runs past an iron age fort and a succession of bronze age barrows. The ancestors chose to be buried here overlooking this scene for all eternity. They must have considered it to be a very special place. What makes it better is that we in the UK do not have to travel far to see it. The viewpoint is in Dorset, a county which is among the most attractive in Britain. 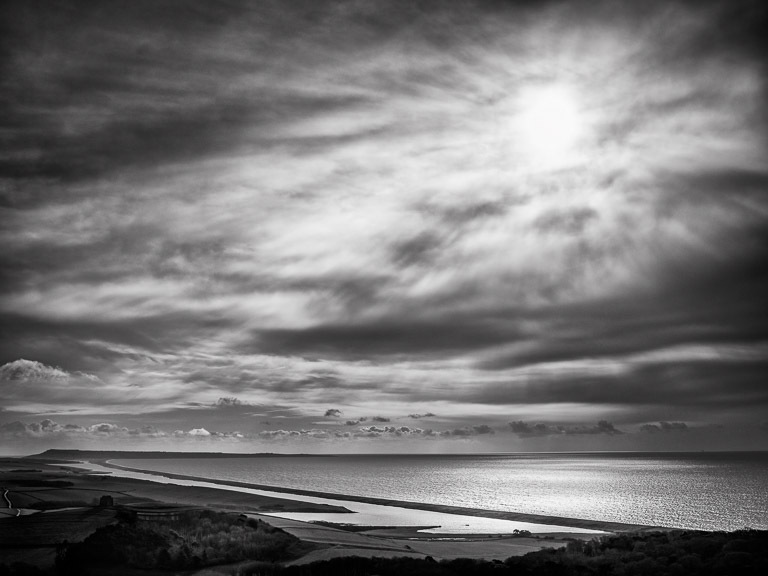 The outline of Chesil Beach, with the Fleet behind it, running down to Weymouth with Portland beyond is familiar to many. Nor does it require a long walk. It is visible from the B3157 as it crests Abbotsbury Hill at the start of its steep descent into the village. It is difficult not to be awestruck by the majesty of the landscape below as the view reveals itself. Helpfully, there are several laybys for people to stop and take in the scene. They are a necessity as stop they do. It is a commanding view. On the day I took this shot, there was virtually no traffic due to a road closure a few miles further along. Yet even then, someone parked their car next to mine and said the opportunity to take a photo was too good to miss. A sentiment with which I cannot disagree. It is not the first occasion that I have photographed here. Yet despite its splendour, it is not the easiest place to obtain a good image. The “laws” of composition demand such aspects as lead in lines or foreground interest, none of which are present. Yet on a dull and overcast winter’s day, with the sun barely managing to peak through the grey clouds, I found a moodiness which is not always present. Perfect for conversion to monochrome to complete the effect. Who says there is such a thing as “poor light”? A few technical details. I have an enthusiasm for adapting old, manual focus lenses onto a digital camera body. In this case, it is a Sony A7 II for which I own no native lenses. Everything I attach to it was originally designed for other systems, usually for use with film. Modern trends often favour sharpness, but that can be at the expense of other characteristics. Older lenses can still be sufficiently sharp, but bring their own attributes to the rendering of an image. Prime lenses are usually prized over zooms, but in this instance I used a Minolta MD 35-70 f/3.5. They are inexpensive to acquire but are known to be good performers. While it was mainly a cloudy day, the sun did shine briefly. 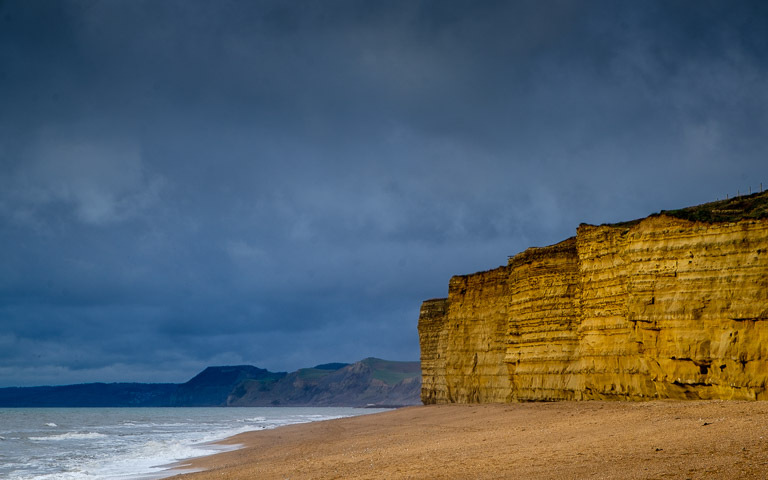 Further along the coast at Burton Bradstock, I was fortunate to be present when it lit the sandstone cliffs there. In the right conditions, they have a wonderful orange glow. It had been a bit of a strange week, mainly as I was unwell and did not take as many photos as I might otherwise have done. Fortunately, I was feeling fit enough for a camera club outing to Hastings at the weekend, where I eventually took my photo of the week. 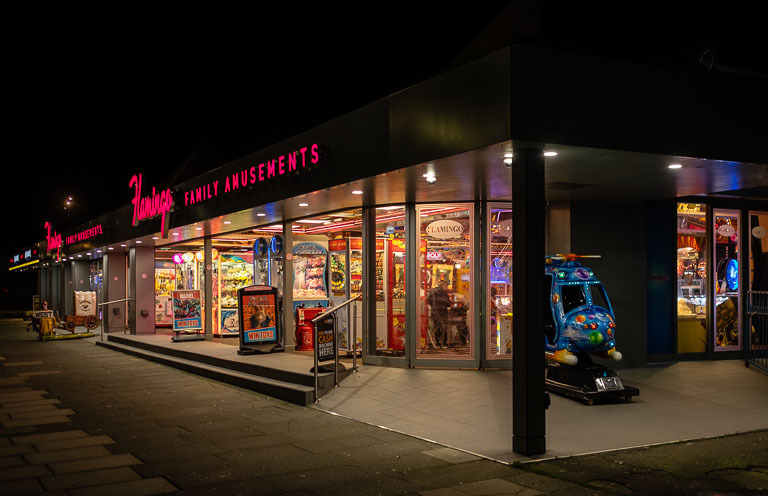 A night time shot of the Flamingo amusement arcade. 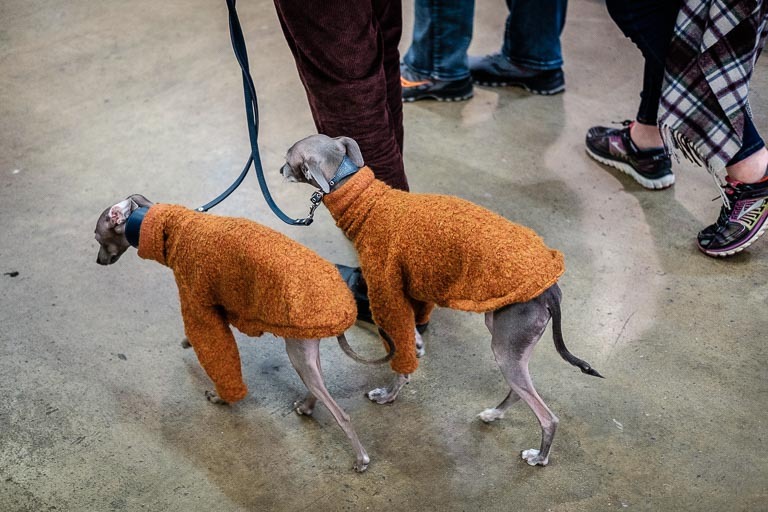 I am well aware of what is likely to happen were I to put this image in front of a camera club judge. Most of the buildings which I photographed were facing onto the street and I had little option other than to shoot them head on. It turned out not to be a particularly interesting viewpoint. The arcade is separate from the surrounding buildings, so I was able to take it at an angle. That does mean that I could get some pleasing diagonals but it does mean the corner post on the right becomes very obvious. Many judges, although by no means all, would comment that it acts as a division and they can see two images. Is it really such a problem? I do not think so. For me, the principal part of the image is the doorway. The post, while indeed prominent, helps to keep the eye in the frame and emphasises the door. I like to think that it helps invite the view to walk down the short path to the door. Sometimes I find that judges critique by rote and consequently overlook what the photographer has set out to achieve. The day at Hastings had not started well. I had attempted to do some long exposures, but had struggled to get the camera set up. Partly that was due to the cold wind which did not help the fiddly business of attaching the filter and adjusting the camera settings. I had also neglected to take my tripod with me and was relying on a Gorillapod to do the honours instead. Having triggered the first exposure, I watched as the camera wobbled in the wind. Eventually, after a few more nondescript exposures, I gave up and headed off in the direction of the pier. This shot is created from seven separate images which I stitched into a panorama using Lightroom. I liked the symmetry between the pier and the storm drain outlet in the foreground. The brooding sky contrasting with the luminance of the sea I also find pleasing. The morning turned out to have the best light which I had largely squandered with my futile long exposure attempts. After lunch, conditions turned into a dull, overcast winter’s day. I struggled to find inspiration. Sometimes, it goes like that. Once it would have bothered me if things were not going well. Nowadays, I simply wait to see what happens next. You are potentially only ever one shot away from a good image. It is the unexpected nature of photography which, for me at least, makes it so fascinating. Most people called it a day as the sun went down unseen behind a thick bank of cloud. I decided to stay on for a bit to see what the evening in Hastings would offer. Despite being a Saturday, or maybe because it was, many places were still open. There were plenty of opportunities for some night time shots. The lack of a tripod was not a problem, with a fast lens there was more than enough light to shoot handheld. I will admit, though, the exposure for my chosen shot, f/2 @1/55 and ISO 200 did surprise me. Initially I thought that the ISO would need to be higher. Overall, I enjoyed the trip to Hastings. There is a lot to see and I did not get to all of it. The town is definitely worth a return visit. In order to have a selection of images for my shot each week, I like to have a variety of different subjects from which to choose. To that end, some are “safety shots”, available to fall back on if need be. A few years ago, I did a photo-a-day project. While it helped my photography immensely, but I did find that flowers became a frequent standby subject. This time around, I determined that where possible I would not rely on such images. It is not an absolute rule. Besides, flowers have their own beauty and there is no reason to avoid them entirely. 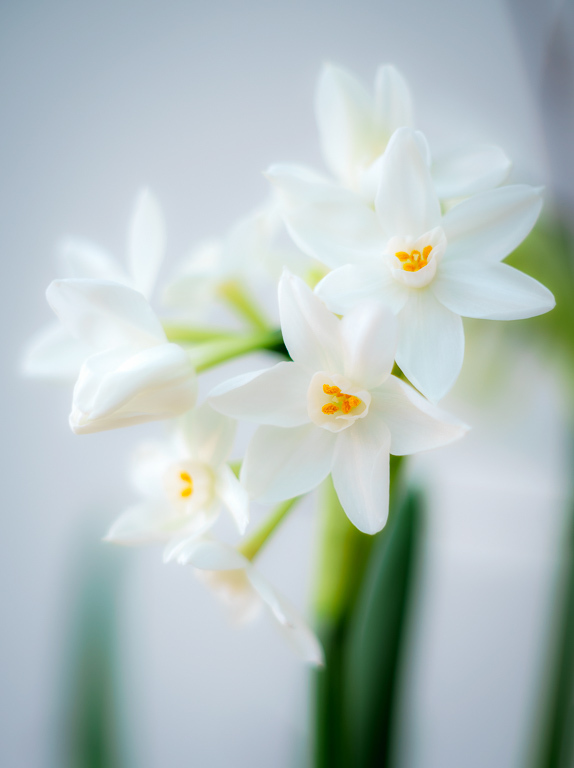 These narcissus are home grown and are a harbinger of spring. My health issues meant that I was not venturing out much, so I needed something. These flowers were at their peak and were a perfect opportunity to ensure I would have something. My chosen lens was an elderly Vivitar manual focus 55 f/2.8 macro lens. It is probably at least 35 years old. I mounted it on a Sony A7 II using an inexpensive adapter. I do enjoy giving new life to these lenses and using them on camera bodies for which they were never intended. Many of them have a character which is often missing from modern lenses. Since I rarely use autofocus for macro work, its absence was actually a benefit. I know that the point of focus is not going to move from where I set it. Despite its age, the lens is very sharp although it appears to be optimised for macro. It does go all the way out to infinity, but there is little point. There are other lenses which perform better at longer focussing distances. At first, I had the lens stopped down but I was not finding that satisfactory. There was too much depth of field and the results were fairly ordinary. Eventually, I opened the lens to its maximum f/2.8 aperture and concentrated on just one bloom. I liked the resulting out of focus effect, but it was not enough. In Lightroom, I applied some negative Clarity but still wanted more. I made a quick round trip to Photoshop where I applied the Glamour Glow filter which is in the Color Efex application from the Nik Collection. I find many of the Color Efex filters to be redundant, but Glamour Glow is useful on occasion to help lift an image.